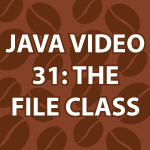 In this part of the Java Video Tutorial, I completely cover the Java File Class. I’ll show you how to create and delete files and directories. How to pull lists of files from directories and manipulate them. We’ll look at the errors to watch out for and a whole bunch more. All of the code follows the video and should be used to help you understand this topic better. Very interesting tutorial once again. One question, if i wanted to create for example a 3d cube that could be moved by a user to see the different faces from whatever angle, possible in a way turn it into a menu, with different items on each face. What programming knowledge and languages do you think would be needed to achieve something like that? I know it’s a slightly random question but i appreciate any help! Thanks. It would be very easy to do that with Flash, but the internet is moving away from Flash. I’ll cover Java OpenGL in future tutorials. It would allow you to do that. HTML5 can also be used for that, but every browser uses it differently. I have solutions using all of those technologies in upcoming tutorials. Hello… Thanks for another great tutorial. I’ve tried it out, and in the line where mkdir() is, i got an error… is this related for you being on a mac and me on Windows? can you tell me how to solve this, please.